Other than the in-room and nearfield measurements, for which I used an Earthworks QTC-40, the quasi-anechoic measurements of Vienna Acoustics' Klimt The Kiss were all performed using DRA Labs' MLSSA system and a calibrated DPA 4006 microphone. The Kiss's voltage sensitivity is specified as 89.0dB/2.83V/m; my estimate of this was significantly lower, at 86.5dB(B)/2.83V/m. 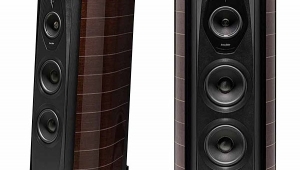 This was not unexpected, as the speaker didn't play appreciably louder (at the same drive level) as the Denon SC-CX303, which has a measured sensitivity of 85.6dB (and which I write about elsewhere in this issue. The Kiss's electrical impedance didn't vary much with the positions of its rear-panel switches. The upper traces in fig.1 were taken with the Bass and Treble switches in the up position, the lower traces with them in the lower position. 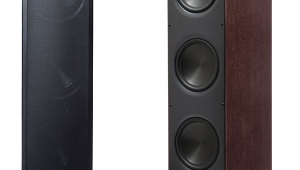 Not only is The Kiss a demanding load, with an impedance that drops to 2.6 ohms at 100Hz, and awkward combinations of 4.1 ohms and a 30° electrical phase angle at 77 and 150Hz, but there is a large disparity between the low-frequency impedance and that between 1 and 3kHz. With tube amplifiers having a typically high source impedance, this disparity will emphasize the speaker's balance in the low treble. The traces in fig.1 are free from the glitches that would suggest the presence of cabinet resonances. Investigating the cabinet walls' vibrational behavior with a plastic-tape accelerometer did uncover a couple of resonant modes between 600 and 800Hz, but these are low in level on the sidewalls and highest in level on the midrange enclosure's top panel (fig.2), where they will have the least effect on the sound. A mode at 100Hz on this panel was absent on all other surfaces. Fig.2 Vienna Acoustics Klimt The Kiss, cumulative spectral-decay plot calculated from output of accelerometer fastened to center of midrange-enclosure top panel (MLS driving voltage to speaker, 7.55V; measurement bandwidth, 2kHz). The broad saddle centered between 30 and 40Hz in the impedance-magnitude trace implies that the tuning frequency of the bass enclosure's 2.5"-diameter reflex port lies in this region. However, the minimum-motion notch in the woofer's nearfield response, which results from the port resonance's back pressure holding the cone still, lies higher in frequency, at 42Hz (fig.3, blue trace), and the port itself features slight peaks below and above this region (red). 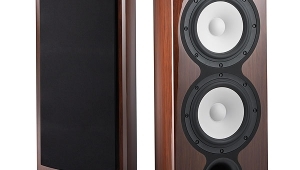 There are also a couple of peaks apparent in the port's midrange output, but these are at a low level and will be even further suppressed by the fact that the port faces away from the listener. The woofer itself has a narrow bandpass, peaking between 70 and 150Hz, while the flat midrange unit (fig.3, green trace) rolls off slowly below 300Hz. This results in quite a degree of overlap between the outputs of the woofer and midrange unit. 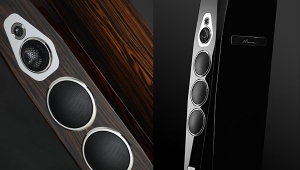 Together with the upper peak in the port's output, this leads to a somewhat boosted output between 80 and 160Hz. Yes, this is exaggerated in this graph by the nearfield measurement technique, but finding the optimal room placement for The Kiss will be critical if the speaker is not to sound overripe. Higher in frequency in fig.3, the midrange and treble response (taken with the B and T switches down) suffers from a lack of energy in the low treble and a slight on-axis boost in the octave between 8 and 16kHz. Whether this behavior will affect the speaker's perceived balance depends on the dispersion, but I was a little alarmed by the presence of the peak just below 2kHz, which I could hear with pink noise. Fig.3 Vienna Acoustics Klimt The Kiss, anechoic response on tweeter axis at 50", averaged across 30° horizontal window and corrected for microphone response, with nearfield responses of midrange unit (green), woofer (blue), and port (red) plotted below 500Hz, 600Hz, and 600Hz, respectively, and complex sum of nearfield responses plotted below 300Hz. Fig.4 shows the Vienna Acoustics' lateral dispersion, normalized to the response on the tweeter axis, which is thus portrayed as a straight line. 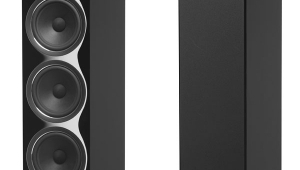 The speaker becomes somewhat directional between 1 and 2kHz, which will work against the audibility of the on-axis peak in the same region. The off-axis flare above 2kHz looks worse than it is because the on-axis suckout between 2 and 3kHz fills in rapidly to the speaker's sides. The tweeter does get quite directional above 10kHz, which means that the excess high-treble energy can be balanced in a given room by experimenting with the toe-in of the midrange enclosure (which swivels independently). 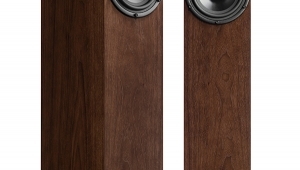 In the vertical plane (fig.5), The Kiss maintains its balance over quite a wide angle, which is a good thing considering that with the speaker on its integral stand, the tweeter is around 46" from the floor, 10" above the average ear height of a seated listener. 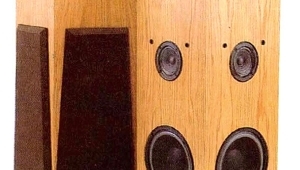 Unfortunately, the top octaves start rolling off a little earlier below the tweeter axis than above, presumably due to the additional baffling effect of the woofer enclosure. 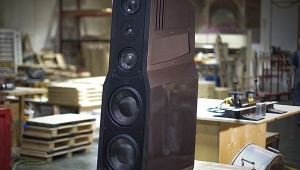 Again, the fact that the upper, midrange enclosure can be tilted down to point directly at the listening position will allow the listener to fine-tune the speaker's top-octave balance. Fig.4 Vienna Acoustics Klimt The Kiss, lateral response family at 50", normalized to response on tweeter axis, from back to front: differences in response 905° off axis, reference response, differences in response 590° off axis. Fig.5 Vienna Acoustics Klimt The Kiss, vertical response family at 50", normalized to response on tweeter axis, from back to front: differences in response 155° above axis, reference response, differences in response 520° below axis. In Wes Phillips' listening room I performed my usual spatially averaged measurement of the review samples' response. The result for The Kiss is shown in fig.6. I derive this graph by averaging 20 measurements taken for each speaker in a rectangular grid measuring 36" by 18" and centered on the position of the listener's ears in his listening chair. I used an Earthworks omni microphone and a Metric Halo ULN-2 FireWire audio interface, in conjunction with SMUGSoftware's Fuzzmeasure 2.0 running on my Apple laptop. The resultant graph shows the effect of both a loudspeaker's on-axis response and its power response. 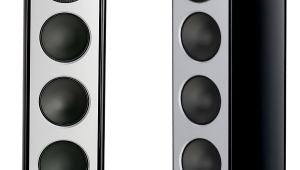 I have found that it quite accurately reflects a speaker's perceived tonal balance. Fig.6 Vienna Acoustics Klimt The Kiss, spatially averaged, 1/6-octave response in WP's listening room. 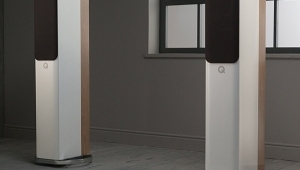 The broad peaks in the low and midbass are mainly the residual effects of room resonant modes that have not been eliminated by the spatial averaging. However, the large peak in the upper bass is also due to the Vienna Acoustics' intrinsic low-frequency tuning, as seen in fig.3. Wes Phillips was impressed by The Kiss's low frequencies, but I suspect he wasn't responding so much to actual extensionthe speaker rolls off below the port tuning frequency of 42Hz, the fundamental frequency of the low E string of the four-string double bass and bass guitaras to the rich presentation an octave higher. The midrange and treble are relatively uniform, though there is a trace visible of the peak just below 2kHz, which may have been exaggerated by the fact that the tubed BAT VK-55SE amplifier was used for the this measurement. The rolloff above 9kHz is due to the increasing absorptivity of the room's furnishings in the high treble. 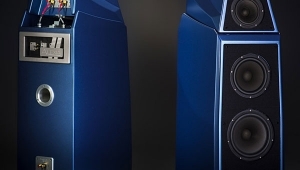 As for The Kiss's balance lower in frequency, I wouldn't have described it as "relaxed," as did WP, particularly in comparison with the Thiel CS3.7, which had less energy apparent in-room in the top two octaves. (See fig.8 in our review, though this response was taken around 36" farther away from the speakers than was that of The Kiss.) However, it's possible that WP was subconsciously taking as his reference level the Kiss's upper-bass region, which is about 5dB hotter than the Thiel's. And, as he noted, the CS3.7's bass does go somewhat lower than The Kiss's. Turning to the time domain, fig.7 shows The Kiss's step response on the tweeter axis. 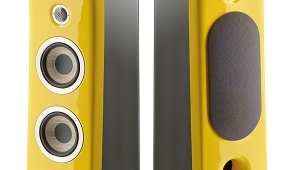 Despite the concentric design of the tweeter/midrange unit, the tweeter's output arrives at the microphone about 300µs before that of the midrange; both are connected in inverted acoustic polarity. 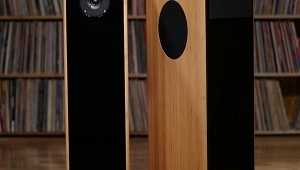 The woofer's step is the slowly rising trace beginning at 4.5ms; connected in positive acoustic polarity, it smoothly follows on from the return of the midrange's step to the time axis. In turn, this correlates with the good frequency-domain integration of their outputs seen in fig.3. The speaker's cumulative spectral-decay plot (fig.8) is disturbed by some high-Q resonances in the mid- and high treble, but of more subjective import is the ridge of delayed energy associated with the on-axis peak at 1.7kHz. The audibility of this resonance will depend to some extent on kind of music being played; however, as I wrote earlier, I could hear the effect of this behavior with pink noise; I do wonder if it contributes to The Kiss's excellent retrieval of recorded detail by adding a slight spotlighting effect. Fig.7 Vienna Acoustics Klimt The Kiss, step response on tweeter axis at 50" (5ms time window, 30kHz bandwidth). Fig.8 Vienna Acoustics Klimt The Kiss, cumulative spectral-decay plot on tweeter axis at 50" (0.15ms risetime).